Operates between the Jordan Creek Town Center area, University Avenue medical corridor, Valley West Mall and the Valley Junction area. Connections: Local Route 11 in the Valley Junction area. 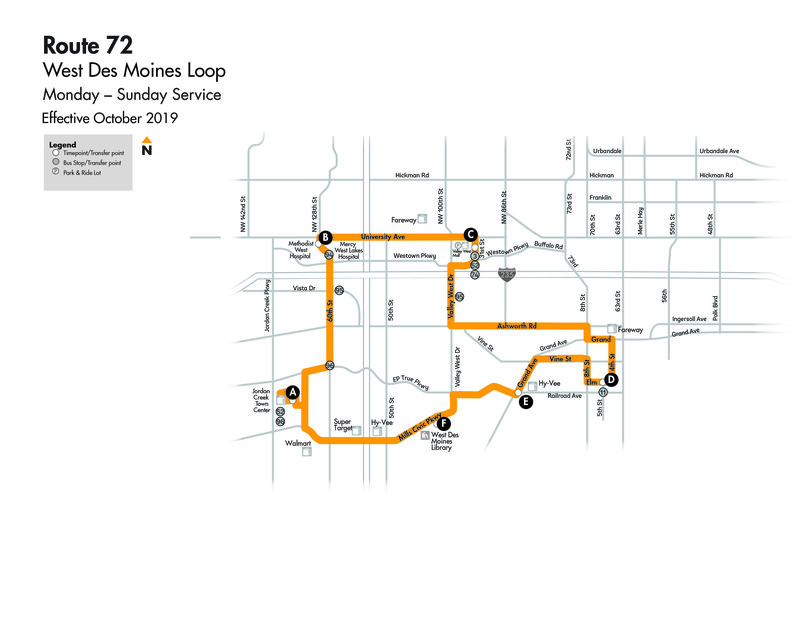 Local Route 3; Crosstown Route 52; Flex Route 74; Express Route 94 at Valley West Mall and at 60th Street and Westown Parkway. Express Route 95 at 60th Street and Vista Drive and Valley West Drive and Woodland Avenue. Crosstown Route 52 and Express Route 96 in the Jordan Creek area. Jordan Creek Town Center 60th St. & Vista Dr Valley West Mall Elm & 5th St. Important Note: The turn-by-turn instructions only describe the base route structure and refer only to the direction of travel when not flexing. The route can flex upon request to specified locations or addresses in the flex zone. The flex zone extends as far east as Mills Civic Parkway & I-35 (Super Target). All remaining recovery time will be completed at Jordan Creek Town Center Century Theaters layover area.